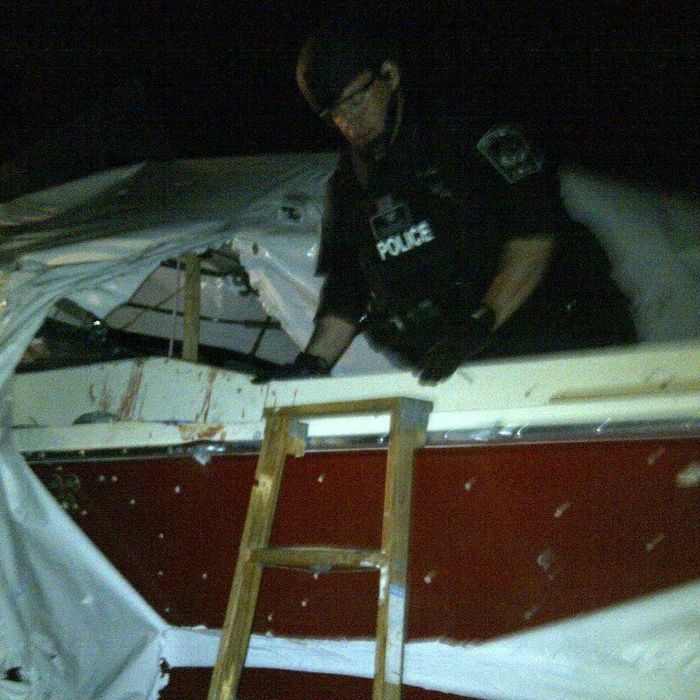 Here’s another one to add to the list of lingering questions about the manhunt for the Boston Marathon bombers: Why did police fire dozens of shots into the boat where Dzhokhar Tsarnaev was hiding when he was unarmed and they were trying to take him alive? While police originally said that officers “exchanged gunfire” with Tsarnaev and captured him with several weapons, officials now say that no gun was found in the boat. That explains why no shots were fired at the Watertown man who found the 19-year-old in his backyard, but apparently the gunshot wound to Tsarnaev’s throat wasn’t self-inflicted — or at least wasn’t a last-minute suicide attempt as police closed in on him. Law enforcement officials interviewed by the Washington Post were defensive, but couldn’t explain what sparked the gunfire either. They said the situation was chaotic, describing it as “the fog of war,” and suggested an accidental shot could have triggered “contagious fire” from the police. “They probably didn’t know whether he had a gun,” said one law enforcement official. “Hours earlier, he and his brother had killed a police officer, shot another officer and thrown explosives out of their cars as the police were chasing them. They couldn’t assume that he did not have a gun and more explosives.” An FBI spokesman praised the officers on the scene for a “tremendously effective outcome under dire circumstances,” but wouldn’t comment on why the officers opened fire, or whether Tsarnaev was hit while in the boat.